Ernest Miller Hemingway (July 21, 1899 – July 2, 1961) was an American novelist, short-story writer, and journalist. He was part of the 1920s expatriate community in Paris, as well as the veterans of World War One later known as "the Lost Generation", as described in his posthumous memoir A Moveable Feast. He received the Pulitzer Prize in 1953 for The Old Man and the Sea, and the Nobel Prize in Literature in 1954. 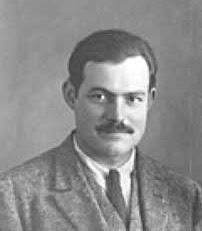 Hemingway's distinctive writing style is characterized by economy and understatement, in contrast to the style of his literary rival William Faulkner. Some say that Faulkner used all the adjectives while Hemingway used none. There is no one better than Hemingway and E.B. White to copy if you want clean, clear, evocative prose. For my favourite excerpt from Hemingway and a discussion of Hemingway and the use of repetition, go to the Hemingway page of Writing Tips at Moore Partners. Posted by Steven Moore at 12:26 p.m.
November 12, 2009 at 2:19 p.m.
Who knows where to download XRumer 5.0 Palladium? Help, please. All recommend this program to effectively advertise on the Internet, this is the best program! November 21, 2009 at 12:36 a.m.
December 8, 2009 at 11:55 a.m.
December 13, 2009 at 7:29 p.m.
December 16, 2009 at 1:54 p.m.
December 18, 2009 at 1:28 p.m.
December 22, 2009 at 5:31 p.m.
January 18, 2010 at 1:14 p.m.
February 14, 2010 at 8:29 a.m.
February 24, 2010 at 6:48 p.m.
February 26, 2010 at 2:36 a.m.
March 26, 2010 at 6:21 p.m.
March 28, 2010 at 5:58 p.m.
March 28, 2010 at 10:51 p.m.
April 7, 2010 at 3:05 p.m.
April 14, 2010 at 5:38 p.m.
April 15, 2010 at 3:10 p.m.
April 15, 2010 at 7:23 p.m.
April 21, 2010 at 11:19 a.m.
April 21, 2010 at 5:06 p.m.
April 23, 2010 at 12:31 a.m.
April 23, 2010 at 3:21 p.m.
April 23, 2010 at 6:18 p.m.
April 25, 2010 at 1:34 a.m.
April 28, 2010 at 3:49 p.m.
April 29, 2010 at 8:53 p.m.
April 29, 2010 at 9:26 p.m.
April 30, 2010 at 12:37 a.m.
April 30, 2010 at 4:29 p.m.
April 30, 2010 at 4:46 p.m.
May 1, 2010 at 9:31 p.m.
May 1, 2010 at 9:49 p.m.
May 1, 2010 at 9:52 p.m.
May 2, 2010 at 9:42 p.m.
May 2, 2010 at 10:37 p.m.
May 2, 2010 at 10:38 p.m.
May 3, 2010 at 2:25 a.m.
May 12, 2010 at 9:24 p.m.
May 14, 2010 at 4:48 p.m.
May 14, 2010 at 6:32 p.m.
May 16, 2010 at 10:07 p.m.
May 21, 2010 at 4:25 a.m.
May 22, 2010 at 9:23 a.m.
May 26, 2010 at 7:57 a.m.
May 28, 2010 at 8:32 p.m.
May 29, 2010 at 8:16 a.m.
May 31, 2010 at 9:11 p.m.
June 1, 2010 at 6:30 a.m.
June 1, 2010 at 7:25 p.m.
June 1, 2010 at 8:18 p.m.
June 1, 2010 at 9:18 p.m.
June 1, 2010 at 9:47 p.m.
June 2, 2010 at 2:29 a.m.
June 2, 2010 at 5:56 a.m.
June 3, 2010 at 11:17 a.m.
June 4, 2010 at 10:15 p.m.
June 5, 2010 at 7:06 p.m.
June 7, 2010 at 9:02 a.m.
June 7, 2010 at 12:01 p.m.
June 8, 2010 at 5:17 p.m.
June 8, 2010 at 6:59 p.m.
June 8, 2010 at 7:58 p.m.
June 9, 2010 at 2:49 a.m.
June 10, 2010 at 9:42 p.m.
June 10, 2010 at 11:42 p.m.
June 11, 2010 at 12:42 a.m.
June 11, 2010 at 7:35 a.m.
June 28, 2010 at 8:51 p.m.
June 29, 2010 at 9:44 a.m.
July 2, 2010 at 11:39 p.m.
September 29, 2010 at 1:21 a.m.
November 28, 2010 at 11:31 p.m.
May 19, 2013 at 3:09 a.m.
May 19, 2013 at 12:08 p.m.
November 3, 2018 at 10:15 a.m. Welcome to The Communications Coach: tips, suggestions, and samples of my own work as a freelance writer and writing instructor. Visit often to help your business writing, persuasive writing, presentations, and overall communication skills. I am Adjunct Professor of Communications and Communications Coach at the Queen’s School of Business in Kingston, Ontario. You can go to www.moorepartners.ca to view my resume and find out more about my company, Moore Partners. I've written for hundreds of corporate and business clients such as RBC Funds, CI Funds, Toronto Dominion Bank, CBC Radio, AT&T, Scotiabank, Canada Life, Empire Life, Bell Canada, Loyalist College, CIBC, Ontario Hydro, Lansing Buildall, and the Canadian Cancer Society. A Member of the Editor’s Association of Canada, my teaching experience also includes the University of Toronto, Queen’s School of English, and Loyalist Training and Development Centre. I've delivered more than 1,000 workshops to corporate clients such as Bell Canada, Domtar, Eagle’s Flight Creative Training Excellence, Inc., Addiction Research Foundation of Ontario, Novartis, City of Belleville, Invar, and Wilkinson & Company LLP. My clients have laughed, felt encouraged, and learned to write and present their ideas more effectively.